Eat Curry. With Your Plastic Girlfriend. Some people have flesh and blood girlfriends. Others have pillows. And some have plastic toys. One curry restaurant in Tokyo's geek district is sensitive to this. Mammoth Curry is the home to mammoth curry—mammoth curry is 1 kilogram of curry, rice, pork, and raw egg. Yum. 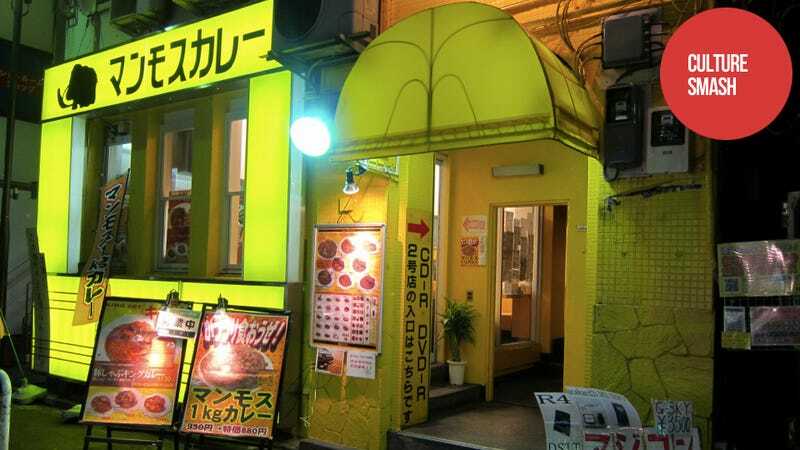 With its location in the nerd haven of Akihabara, Mammoth Curry has otaku-friendly promotions, such as illustration contests, geeky videos, and a special promotion. With plastic figures. Heck, the shop right next to Mammoth Curry sells R4 piracy carts! Mammoth Curry runs promotions like its "Tanabata" event for couples. Tanabata is Japan's most romantic festival, in which two gods, separated by the Milky Way, meet one night a year on the seventh day of the seventh month. The Mammoth Curry Tanabata event offers couples the chance to order one lady's plate of curry free of charge. Questions arose over what if one member of the couple is virtual or plastic? The restaurant's rules stipulate that 2D girls—specifically pointing to Konami's love simulator game Love Plus or plastic figures—don't get a free plate of curry, but a free drink. Likewise, women who bring their 2D boyfriends or plastic figures also get a free drink. Starting on July 18 (today! ), Mammoth Curry is running a special figure campaign. According to Get News, customers who bring plastic boyfriend or girlfriend figures can get a free drink. To get the drink, you must put the figure on the table. This is a stunt, sure, and a good way for Mammoth Curry to get some free publicity. But as jaded as I am, I still can't help but think that, yes, in Akihabara questions over whether figures count as girlfriends or boyfriends are very real indeed.